In Matthew 22 Jesus speaks to the disciples in a parable that we regard as “the parable of the wedding feast.” He starts of by telling them that “the kingdom of heaven could be compared to a king who gave a wedding feast for his son..” (verse 2). He proceeds to tell them that the king sent out his servants to invite people, but the people would not come. He sent more servants to invite them to the wedding, but the people paid no attention to them, treated them shamefully and even killed them. He sends out new servants with new instructions, “Go therefore to the main roads and invite to the wedding feast as many as you find.” These servants gathered good and bad (a foreshadow that Gentiles would later have the gospel message offered to them, but more on that in a different post) people, and the wedding hall was filled with guests. But the king comes in and sees a man without the wedding garment and asks him, “Friend, how did you get in here without a wedding garment?” (verse 12). The man was speechless, and at once the king had him bound and cast into outer darkness. The wedding garment represents Christ’s righteousness that is laid over us. This is the way that Jesus taught that our self-righteousness would never be enough! From the very beginning of creation, God has provided a “covering” for our sin. To insist on covering ourselves is to be clothed in “filthy rags” (Isaiah 64:6). Adam and Eve tried to cover their shame, but they found their fig leaves to be woefully scant. God took away their handmade clothes and replaced them with skins of animals (Genesis 3:7, 21). In the book of Revelation, we see those in heaven wearing “white robes” (Revelation 7:9), and we learn that the whiteness of the robes is due to their being washed in the blood of the Lamb (verse 14). We trust in God’s righteousness, not our own (Philippians 3:9)! The man who did not wear the wedding garment is an example of one who trusts in his own righteousness and merit to get into heaven! It simply cannot be done, if we try to do so, we will be cast into outer darkness. The king provided wedding garments for his guests, and God has provided salvation for mankind through Christ! My friends, our wedding garment is the righteousness of Christ, and there is no wedding feast for us if we do not have it! When the religions of the world are stripped down to their basic tenets, we either find man working his way toward God, or we find the cross of Christ. Jesus crucified, buried and resurrected is the only way to God, for He himself says, “No one comes to the Father except through me” (John 14:6). God has invited us to a wedding feast, and an eternity with him. Our invitation comes with a garment that we must receive and put on to enter: Christ’s righteousness. We do this by trusting in His life and finished work on the cross to cover our sins, without any bit of trust in our own merit or good works. If we trust in ourselves, our own righteousness, and our good works to gain us entrance to the feast, we wil be cast in to utter darkness: eternity in hell. However, the kingdom of heaven is opened to those who will set aside their own righteousness and by faith accept Christ’s righteousness. 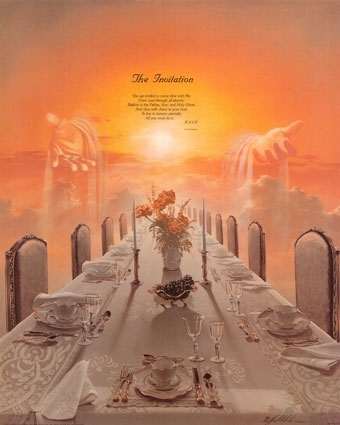 My friends, there is a heavenly wedding feast awaiting, and your invited. The question is, do you have the attire?